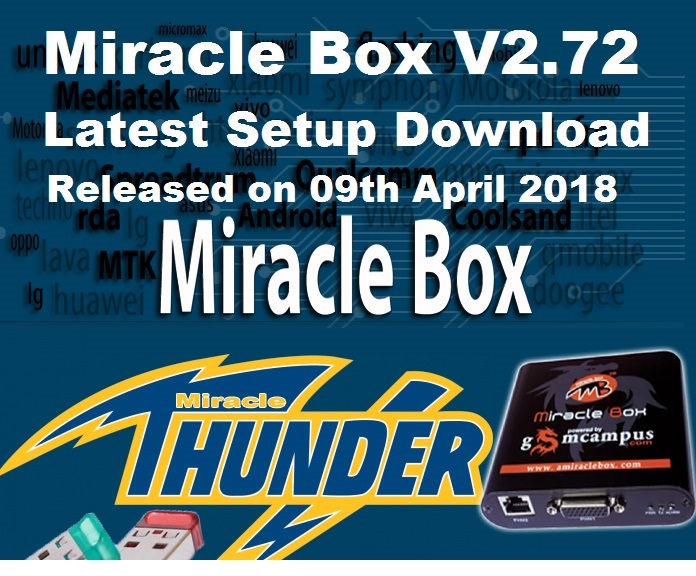 Miracle Box has released a new version of Miracle Box setup V2.72 and here you can download the Miracle Box Update Setup and Miracle Box 2.72 full setup can be download here. 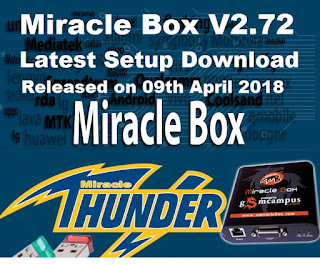 As you know Miracle Box is very popular flashing and unlocking box for MediaTek, Qualcomm and Spreadtrum Android smart phone and as well as for Feature phone. This Miracle tool is supports a large variety of Android smartphones i.e. Oppo, ViVo, Samsung, Micromax, Lava, Xolo, Motorola, Lenovo etc. for various unlocking and flashing firmware. To unlock Android smart phones the Miracle box allows you to use various ways such as ADB Mode Method to unlock or FRP unlocking, Fastboot Mode, EDL Mode and COM Port Modes etc. You can also boot into fastboot mode, reboot to bootloader, boot in to edl mode, repair IMEI, fix unknown baseband, EDL mode mi account bypass or unlock, Redmi Mi flashing, Mi cloud account unlock, remove MIUI 9 Mi account, remove FRP on Samsung, FRP unlock OPPO and ViVo etc. Miracle V 2.72 THUNDER Update Released on 09th April 2018. >>Miracle Box V2.54 100% Working Without Box. MTK Add GIONEE Read/Write/Format Support Models: GIONEE 8001/S11. MTK Add Skip Preloader for Write. MTK Improve EMMC Format and FRP Remove. Qualcomm add QiKu 360 Read/Write/Format Support Models: 360 N5, 360 Q5, 360 N5A, 360 N5S, s360 N6 Pro. Wiko Mobile Qualcomm: MSM 8909, MSM 8916, MSM 8917, MSM 8936, MSM 8937, MSM 8940, MSM 8953. SPD Add new SC7731G support. Spreadtrum (SPD) Improve SC9832 Boot Add New Mobile Support. Android Improve Xiaomi Remove All Lock in Recovery.